Yesterday, Mansfield hosted our second quarterly market update webinar. We tackled issues including whether Trump can lower prices, where prices are going in Q3 and beyond, and discussed regional trends that could impact your local fuel prices. If you missed it yesterday, don’t miss it today. Click below to tune in. 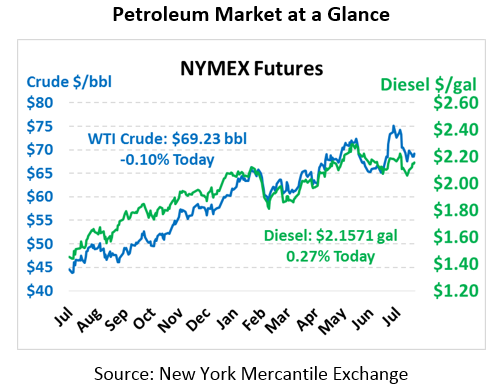 Yesterday brought bullish news that helped give prices a lift, sending WTI crude up above $69 once again. This morning, prices opened higher but are seeing some slight downward pressure as the morning progresses. WTI crude is currently trading at $69.23, a meager loss of 7 cents. Like crude, fuel prices are barely moving after yesterday’s moderate gains, though fuel is being moving gently in the opposite direction. Diesel prices are $2.1571, up 0.6 cents since yesterday. Gasoline prices are $2.1314, picking up 0.8 cents. Markets began their enthusiasm yesterday in response to the EIA’s weekly inventory data, which showed a crude draw far exceeding expectations. With inventories already quite low compared to previous years, further draws from national inventories are keeping prices elevated. 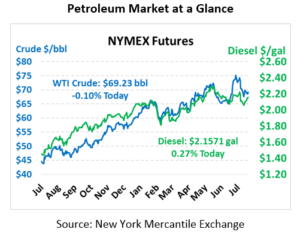 When markets realized that most of the draw came from the West Coast, which is relatively isolated from the rest of America’s fueling infrastructure, prices let off the gas and began to fall once again. Cushing inventories were also a major takeaway from the report, as inventories in Cushing, OK hit their lowest point since November 2014. Although still 10 million barrels above multi-year lows, the decline does signify tightness in the market that could keep American crude prices elevated until Canada brings its Syncrude facility back online completely. Markets rallied then receded following the EIA’s news, but they got an extra boost from the outcome of US-EU trade conversations held by Trump with European Commission President Juncker. Both sides agreed to cut industrial tariffs among other specific changes, and Trump noted that the US is willing to work towards zero tariffs. As markets worry that US-China trade could plummet amid the on-going trade war, it’s promising to see that Trump is working to improve trade with some countries. First, it means that further trade with Europe could offset some of the lost trade with China (though European goods are far more expensive than Chinese goods, so it won’t be a direct offset). Second, it shows that Trump is not fully entrenched in the protectionist camp – he can embrace free trade under the right conditions. This point lends itself to the perspective that the US-China trade war is really just “the art of the deal” and not a move to torpedo bilateral trade long-term. Both of those points are important. Trade tends to prop up the economy, boosting fuel demand, as well as directly increasing demand as goods are shipped farther to be consumed, using more fuel along the way. Oil markets have been worried lately about the US-China trade war causing severe economic damage – this latest meeting with the EU provides a glimmer of hope that the economy could get through unscathed.